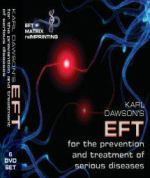 This 6-DVD set is a comprehensive resource for using EFT to treat and prevent serious physical and psychological illness. EFT Master Karl Dawson gives an engaging and highly informative overview of the process of auto-immune and other serious diseases, such as chronic fatigue/ME, thyroid problems, chronic pain and stomach issues. Karl then addresses the disease process using EFT, Matrix Reimprinting, correcting lifestyle and nutrition. His innovative new technique, Matrix Reimprinting, has the ‘present you’ tap on the ‘you of the past’. It is proven to be highly effective and successful with multiple group sessions and one-on-one demonstrations, with undeniable amazing results. This set is filled with imperative information and demonstrations for anyone wishing to prevent and help recovery from serious disease in their own life or in their practice. Some of the topics covered in this 6 DVD set from a live two-day training at Studley Castle, summer 2008. What do we really mean by stress? Plus, lots of other invaluable understanding and solutions when working with clients with mental, emotional and physical issues.